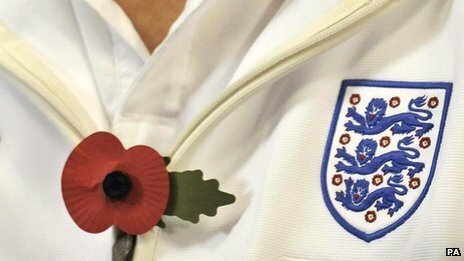 FIFA has finally agreed to allow England team to wear poppies on their black armbands during Saturday's match against Spain at Wembley. FIFA does not allow shirts to carry political, religious or commercial messages. This move came after a written request by Prince Williams and Prime Minister David Cameron to FIFA, to allow shirt embroidered with poppies. Prince Williams, Duke of Cambridge, is also the President of Football association (FA). England and Wales' rugby league players will also wear poppies this weekend, along with the other two teams - Australia and New Zealand - involved in the Four Nations.